Tim Burton’s live-action take on Disney's animated classic veers from bland to bonkers and back again. 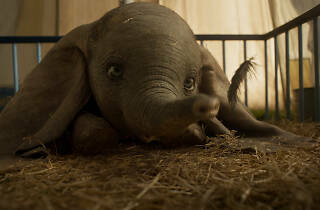 Let’s tackle the baby elephant in the room first: How does Disney’s beloved Dumbo look in a live-action movie? 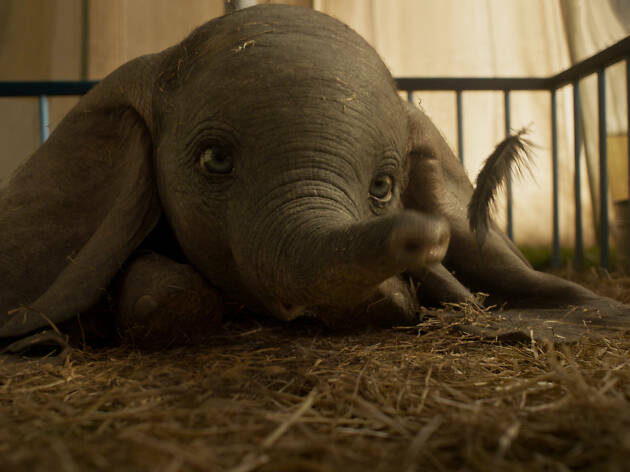 Happily, the teeny pachyderm is a suitably heart-melting presence in Tim Burton’s relatively orthodox redo of the 1941 animation classic. All giant expressive eyes and beach-towel ears, he’s a computer-generated creation that exudes picture-book warmth. It’s only when flying that he seems a bit clunky. Then again, maybe that’s the point. He is, after all, the least aerodynamic character to fly in a movie since Brian Blessed wobbled through Flash Gordon. The fact that you know his story inside out presents a challenge that Transformers screenwriter Ehren Kruger tries to overcome by introducing swathes of new human characters. Danny DeVito plays pompous impresario Max Medici, whose traveling circus is going a bit Grapes of Wrath in the dust bowls of the Midwest. Money is short and his last hope is the magical baby elephant tended to by damaged WWI veteran Holt Farrier (an oddly forgettable Colin Farrell) and his two willing kids, Milly (Nico Parker) and Joe (Finley Hobbins). Both are grieving for their mom, providing an obvious connection with Dumbo when the baby elephant’s own mother is sold. In truth, Burton, that great lover of scrappy outsiders, struggles to mine much beyond ponderous sincerity from these sluggish early scenes. Even a cast of oddball circus regulars—strongman, mermaid, snake charmer, etc.—fails to fire the director's imagination. Then Michael Keaton’s brash entrepreneur V.A. Vandevere, the “Columbus of Coney Island,” rolls up, offering to buy the circus, and the movie blazes to life. When Vandevere marches the wide-eyed troupe into his vast New York amusement park, the scene is gaudy, over-the-top and green-screened within an inch of its life—and all the better for it. Here, Burton in his element, presiding over an artificial Xanadu where spectacle piles on spectacle until the whole frame groans with visual candy. With production designer Rick Heinrichs, he forsakes his beloved gothic touches for an art deco style that lends it all a Gatsby-esque decadence. Even leaving aside the fan-pleasing sight of Burton’s Dark Knight and Penguin sharing the same big top, the Batman parallels are inescapable. Keaton tears a page from the Jack Nicholson Joker playbook with his most deliriously huge performance in years. Inevitably, there’s a bit of real-life crowdpleaser P.T. Barnum in there too, although Dumbo is as disappointingly short of things to say about today’s populist-hungry world as The Greatest Showman was. Instead, the story is busied-up with subplots involving Alan Arkin’s cynical financier and a will-they-won’t-they? (they will) romance between Holt and Eva Green’s Parisian acrobat-turned-elephant rider. Unsurprisingly, little Dumbo seems a bit lost in the hubbub at times. There’s bad news for fans of Timothy Q. Mouse, too, with the original’s rodent ringmaster reduced to a blink-and-you’ll-miss-it cameo. On the upside, the egregious racist crows have been jettisoned entirely, while Dumbo mega-fans can revel in a Pink Elephants on Parade sequence that’s equal parts mesmerizingly weird and completely out of place. Me? I was happy to see Casey Jr. again—even if the cheery little locomotive in this version bears the rictus grin of an express train to hell. Maybe there’s a bit more Burton in here than at first appears.